An interesting end for the precious commodity, with the gold price closing the week marginally below the $1000 per ounce level once again, and closing the trading session with a narrow spread down bar, but one with a deep lower wick, and ending well above the 40 day moving average. Following Thursday’s sharp sell off in spot gold prices, gold bugs were expecting the worst, particularly as this price action also breached the 9 day and 14 day moving averages, with Friday adding further downwards pressure. 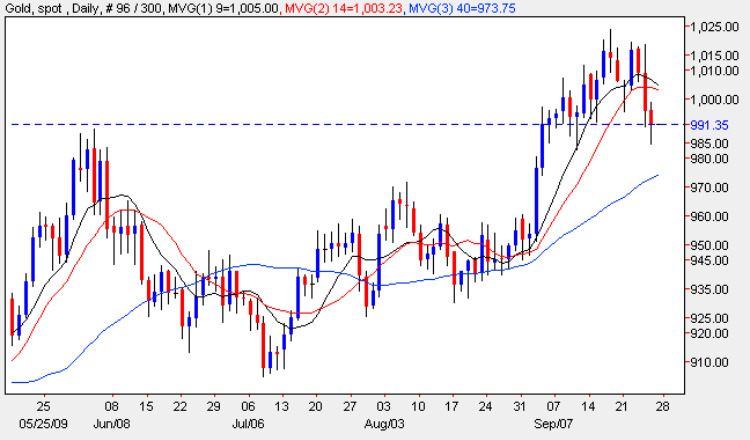 However, it was interesting to note that the gold prices found some support from the $991 level where a minor platform was created earlier in the month, and in addition the deep lower wick of Friday’s candle suggests that we could see a rally in the spot gold price early in the week as a result. For a sustained move higher we need to see the $1015 level breached, and provided the spot gold price holds above this level then we should see the rally continue in due course. However, should the current support level fail to provide the requisite support, then the spot gold price may fall further to re-test the next price level at $983 in due course. However, we also need to bear in mind that we are still some way above the 40 day moving average, and until this is breached, then the short term bearish tone may be just that – a short term reversal before rallying and moving higher once again. The short term gold trading analysis for the gold price is bearish, the medium term is sideways and the long term is bullish.